Recently, I was on the phone with someone who mentioned they are always looking for IT-related content and do searches each week on relevant materials. I asked if they had ever used our Topics page and I was excited to introduce another person to my favorite method of finding materials on KnowledgeLeader! I’ve posted before about our Topics page and I this time I thought I would give an example of how to find some items specific to information technology. Impressive right? Just click on one of those links and you’ll see everything related to that topic and then you can narrow the results even further using the filters on that page. 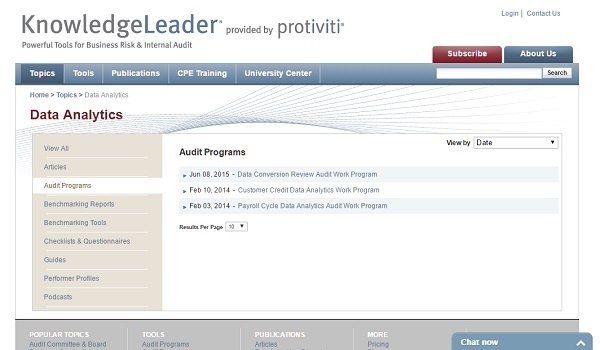 For example, do you only want to see Audit Programs having to do with Data Analytics? You can do that. Other lists that are of interest to IT Audit Managers include IT Security, Sarbanes-Oxley Act and Risk Assessment. Take a look and if you don’t find what you’re looking for, let us know. We’re happy to help!